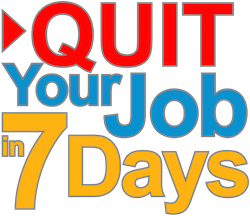 If you purchase goods from our site, our terms and conditions of supply QUITYOURJOBIN7DAYS.COM/terms-n-conditions-of-supply will apply to the sales. Please check this page from time to time, to take notice of any changes we made, as they are binding on you. Some of our websites and funnels are made available free of charge. We do not guarantee that our sites, or any content on it, will always be available or be uninterrupted. Access to our sites are permitted on a temporary basis. We may suspend, withdraw, discontinue or change all or any part of our sites without notice. We will not be liable to you if for any reason if our sites are unavailable at any time or for any period. If you are a consumer user, please note that we only provide our site for domestic and private use. You agree not to use our site for any commercial or business purposes unless you have purchased a licence from Online Bizzo, and we have no liability to you for any loss of profit, loss of business, business interruption, or loss of business opportunity. Different limitations and exclusions of liability will apply to liability arising as a result of the supply of any goods by use to you, which will be set out in our Terms and conditions of supply QUITYOURJOBIN7DAYS.COM/terms-n-conditions-of-supply. Whenever you make use of a feature that allows you to upload content to our site, or to make contact with other users of our site, you must comply with the content standards as set out on our site from time to time. You warrant that any such contribution does comply with those standards, and you will be liable to us and indemnify us for any breach of that warranty. If you are a customer user, this means you will be responsible for any loss or damage we suffer as a result of your breach of warranty. We have the right to remove any posting you make on our site if, in our opinion, if your post does not comply with the content standards set out on our site from time to time. The website in which you are linking must comply in all respects with the content standards set out on our site from time to time.